Fort Richardson and Elmendorf Air Force Base were realigned to form Joint Base Elmendorf-Richardson (JBER) which became fully operational on 1 October 2010. 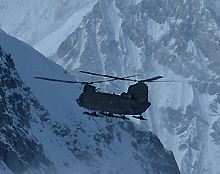 JBER is located in South-central, Alaska, amid picturesque, majestic, snow-capped mountains, lakes, rivers and glaciers. The area abounds with wildlife. The area is considered high cost because of its unique location. The Anchorage community has a military presence of over 29,000 people and accounts for more than 10 percent of the population and is very military friendly!